As long as they put a minority or poor face on crime in America, no one will pay attention to what is really going on behind the scenes. They are preparing for us all. You gotta read this. For anyone paying attention, there is no shortage of issues that fundamentally challenge the underpinning moral infrastructure of American society and the values it claims to uphold. Under the conceptual illusion of liberty, few things are more sobering than the amount of Americans who will spend the rest of their lives in an isolated correctional facility â€“ ostensibly, being corrected. The United States of America has long held the highest incarceration rate in the world, far surpassing any other nation. For every 100,000 Americans, 743 citizens sit behind bars. Presently, the prison population in America consists of more than six million people, a number exceeding the amount of prisoners held in the gulags of the former Soviet Union at any point in its history. While miserable statistics illustrate some measure of the ongoing ethical calamity occurring in the detainment centers inside the land of the free, only a partial picture of the broader situation is painted. While the country faces an unprecedented economic and financial crisis, business is booming in other fields â€“ namely, the private prison industry. Like any other business, these institutions are run for the purpose of turning a profit. State and federal prisons are contracted out to private companies who are paid a fixed amount to house each prisoner per day. Their profits result from spending the minimum amount of state or federal funds on each inmate, only to pocket the remaining capital. For the corrections conglomerates of America, prosperity depends on housing the maximum numbers of inmates for the longest potential time - as inexpensively as possible. 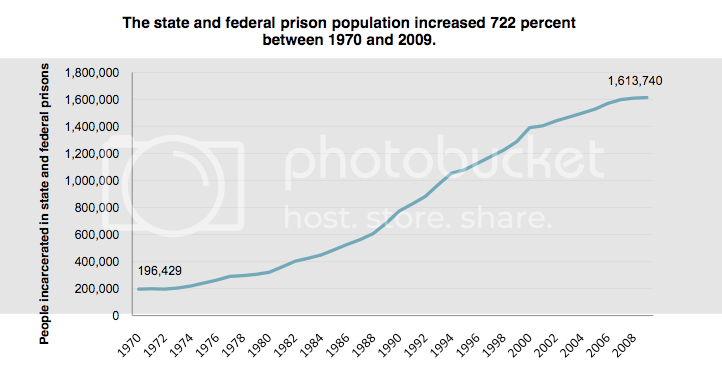 Considering todayâ€™s private prison population is over 17 times larger than the figure two decades earlier, the malleability of the judicial system under corporate influence is clear. 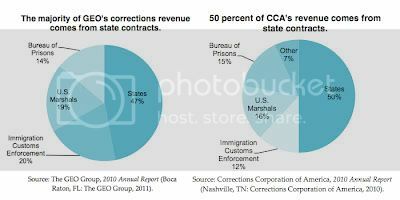 The Corrections Corporation of America is the first and largest private prison company in the US, cofounded in 1983 by Tom Beasley, former Chairman of the Tennessee Republican Party. The CCA entered the market and overtly exploited Beasleyâ€™s political connections in an attempt to exert control over the entire prison system of Tennessee. Today, the company operates over sixty-five facilities and owns contracts with the US Marshal Service, Immigration and Customs Enforcement (ICE) and the Bureau of Prisons. The GEO Group operates 118 detention centers throughout the United States, South Africa, UK, Australia and elsewhere. Under its original name, the Wackenhut Corrections Corporation was synonymous for the sadistic abuse of prisoners in its facilities, resulting in the termination of several contracts in 1999. The political action committees assembled by private prison enterprises have also wielded incredible influence with respect to administering harsher immigration legislation. The number of illegal immigrants being incarcerated inside the United States is rising exponentially under Immigration and Customs Enforcement (ICE), an agency responsible for annually overseeing the imprisonment of 400,000 foreign nationals at the cost of over $1.9 billion on custody-related operations. The agency has come under heavy criticism for seeking to contract a 1,250-bed immigration detention facility in Essex County, New Jersey to a private company that shares intimate ties to New Jersey's Governor, Chris Christie. Given the private prison industryâ€™s dependence on immigration-detention contracts, the huge contributions of the prison lobby towards drafting Arizonaâ€™s recrementitious immigration law SB 1070 are all but unexpected. While the administration of Arizonaâ€™s Governor Jan Brewer is lined with former private prison lobbyists, its Department of Corrections budget has been raised by $10 million, while all other Arizona state agencies are subject to budget cuts in 2012â€™s fiscal year. In the past, political mouthpieces of the United States have criticized countries such as China and North Korea for their role in exploiting prisoner labor to create commodity products such as womenâ€™s bras and artificial flowers for export. Evidently, outsourcing the construction of the military equipment responsible for innumerable civilian causalities to the prisons of America warrants no such criticism from the military industrial establishment. In utter derision toward the integrity of the common worker, prison inmates are exposed to toxic spent ammunition, depleted uranium dust and other chemicals when contracted to clean and reassemble tanks and military vehicles returned from combat. Prison laborers receive no union protection, benefits or health and safety protection when made to work in electronic recycling factories where inmates are regularly exposed to lead, cadmium, mercury and arsenic. In addition to performing tasks that can result in detrimental illnesses, prison labor produces other military utilities such as night-vision goggles, body armor, radio and communication devices, components for battleship anti-aircraft guns, land mine sweepers and electro-optical equipment. While this abundant source of low-cost manpower fosters greater incentives for corporate stockholders to impose draconian legislation on the majority of Americans who commit nonviolent offenses, itâ€™s hard to imagine such an innately colossal contradiction to the nationâ€™s official rhetoric, i.e. American values. Furthermore, prison labor is employed not only in the assembly of complex components used in F-15 fighter jets and Cobra helicopters, it also supplies 98% of the entire market for equipment assembly services, with similar statistics in regard to products such as paints, stoves, office furniture, headphones, and speakers. It is some twisted irony that large sections of the workforce in Americaâ€™s alleged free-market are shackled in chains. Weapons manufactured in the isolation of Americaâ€™s prisons are the source of an exploitative cycle, which leaves allied NATO member countries indebted to a multibillion-dollar weapons industry at the behest of the U.S. State Department and the Pentagon. Complete with its own trade exhibitions, mail-order catalogs and investment houses on Wall Street, the eminence of the private prison industry solidifies the ongoing corrosion of American principles â€“ principles that seem more abstract now, than the day they were written. Predictably, the potential profit of the prison labor boom has encouraged the foundations of US corporate society to move their production forces into American prisons. Conglomerates such as IBM, Boeing, Motorola, Microsoft, AT&T, Wireless, Texas Instrument, Dell, Compaq, Honeywell, Hewlett-Packard, Nortel, Lucent Technologies, 3Com, Intel, Northern Telecom, TWA, Nordstrom's, Revlon, Macy's, Pierre Cardin, Victoriaâ€™s Secret, and Target have all begun mounting production operations in US prisons. Many of these Fortune 500 conglomerates are corporate members of civil society groups such as the Council on Foreign Relations (CFR) and the National Endowment for Democracy (NED). These think tanks are critical toward influencing American foreign policy. Under the guise of democracy promotion, these civil societies fund opposition movements and train dissent groups in countries around the world in the interest of pro-US regime change. With naked insincerity, the same companies that outsource the production of their products to American prisons simultaneously sponsor civil societies that demanded the release of Myanmarâ€™s Aung San Suu Kyi from house arrest â€“ an overly political effort in the on-going attempts to install a compliant regime in that country. The first private prison models were introduced following the abolishment of slavery after the American Civil War from 1861 to 1865, which saw expansive prison farms replace slave plantations. Prisons of the day contracted groups of predominately African-American inmates to pick cotton and construct railroads principally in southern states such as Alabama, Georgia and Mississippi. In 2012, there are more African-Americans engrossed in the criminal-justice system than any point during slavery. Throughout its history, the American prison system has shared little with the concept of rehabilitation. Like the post-Civil War prison farms, todayâ€™s system functions to purport required labor, largely on a racially specific basis. African-Americans consist of 40% of the prison population and are incarcerated seven times more often than whites, despite the fact that African-Americans make up only 12% of the national population. Once released, former inmates are barred from voting in elections, denied educational opportunities and are legally discriminated against in their efforts to find employment and housing. Few can deny the targeting of underprivileged urban communities of color in Americaâ€™s failed War on Drugs. This phenomenon can largely be contributed to the stipulations of its anti-drug legislation, which commanded maximum sentencing for possession of minute amounts of rock cocaine, a substance that floods poor inner-city black communities. Unbeknown to the vast majority of Americans, the US government has been actively taking steps to modify the legal infrastructure of the country to allow for a dramatic expansion of the domestic prison system at the expense of civil rights. On December 31st, 2011, Barack Obama signed into law the National Defense Authorization Act (NDAA) H.R. 1540. Emulating the rouge military dictatorships the US Government has long condemned in its rhetoric, the NDAA introduces a vaguely worded legislation that allows for US citizens to be arbitrarily detained in military detention without due process - might they be predictably deemed radical, conspiratorial or suspected of terrorism. In a climate of rising public discontent, the establishment media has steadfastly worked to blur the line between public activism and domestic extremism. In addition to the worldâ€™s largest network of prison facilities, over 800 located detainment camps exist in all regions of the United States with varying maximum capacities. Facing economic stagnation, many Americans have been detained in responder camps as a consequence of publically demonstrating in accordance with the Occupy Wall Street movement launched in New York City. Under the guise of protecting Americans from a largely contrived and abstract threat of fundamentalist violence, citizens have been denied the right of peaceful assembly and placed in detainment apparatuses, managed by the Federal Emergency Management Agency (FEMA). Documents have been released by the American Civil Liberties Union detailing the Pentagonâ€™s widespread monitoring of public demonstrations and the targeting of individual activists under threat of national security. Co-authored by Senator Joe Lieberman, the Enemy Expatriation Act (HR 3166) gives the US government the power to detain nationals and revoke their American citizenship under suspicion of behavior perceived as terrorism. The partnership between the United States government and its corporate associates spans various industries however, they all seek the common pursuit of profit irrespective of the moral and ethical consequence â€“ the human consequence. The increasing influence of the Prison Industrial Complex towards official legislation and economic undertakings signifies a reprehensible threat to basic human rights. Perhaps the issuance of government legislation that leads offenders into detainment for the benefit of private shareholders is the purest embodiment of fascism, as cited in Mussoliniâ€™s vision of a Corporate State. Perhaps we all (this author included) fail to grasp the seriousness of these legislations and their implications on our lives.